This is the last post in a series of three articles about meal planning and eating healthy at home. The first one was about a fully stocked pantry and fridge. If you missed the second post, it provided 5 Tips To Meal Planning Success. The weeknights can get hectic especially with after-school activities, work commitments and managing a busy household. Here are six of my go-to recipes that you can prep this week to make your meal-prep a little easier. 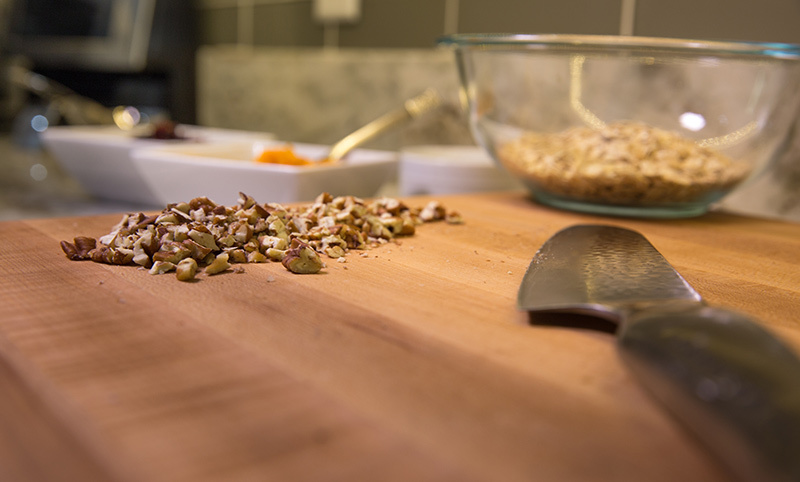 Granola is a great snack to make on the weekends in preparation for a busy week. It’s great with yogurt as breakfast or alone as a snack mid-day when you need a little boost. You can make this granola gluten-free by using gluten-free oats. You can make it grain free by substituting quinoa flakes for the oats. Most granola that you buy at the store has a lot of added sugar from brown rice syrup, cane sugar, brown sugar and some even have high fructose corn syrup. This granola is sweetened with maple syrup that has some nutritional value to boast about. It has vitamins and minerals unlike table sugar that has no nutritional value. As with any sweetener, use in moderation. Be sure to get 100% pure maple syrup that lists “maple syrup” as the only ingredient. You can add dried fruit and nuts in any combination that you’d like. I vary it seasonally to keep it interesting. Preheat oven to 375*. Line a jelly-roll pan with a silicon mat or parchment paper. Mix olive oil and maple syrup in a bowl with a whisk until combined. Mix cinnamon, salt and oats together in a bowl. Mix oats with the olive oil mixture until combined. Spread mixture onto pan. Bake for 13-17 minutes stirring frequently until oats are golden brown. The mixture will continue to cook once removed from the oven so remove the granola mixture as soon as they start to golden to prevent over-cooking. This recipe is a great one to make on the weekend and then eat during the week. The extra day or two in the fridge amps up the flavor. Cook beef and drain any excess fat. Sauté onion and bell pepper in a few tablespoons of olive oil until translucent. Place meat and vegetables into Crock Pot or large pot. Add all remaining ingredients and stir well. Heat on low or in Crock Pot. These are so delicious, you won’t be able to eat just one. These are a great snack for kids’ lunches and for your nagging sweet tooth. The added protein helps keep you full. Mix all ingredients. Refrigerate for 30 minutes to an hour. Form into balls. Yields about 14-16 one-inch balls. Store in refrigerator. This is a great dinner dish that can be prepped the night before or in the morning before you leave for work. This dish is just as yummy as the dip you’d order in a restaurant but without the calories. I serve this dish with an herbed couscous or quinoa. Preheat oven to 375*. Spray large baking dish with cooking spray. Place chicken into baking dish. Salt and pepper the chicken. Mix remaining ingredients and place on top of chicken. Bake 30-35 minutes until chicken is cooked through. This frittata is super versatile and can me made on the weekends and eaten for breakfast during the week. It reheats easily and you can substitute your family’s favorites to make it yours. In a large ovenproof skillet, cook the bacon until crispy. While the bacon is cooking, whisk eggs together with oregano, salt and pepper. Set aside. Add the veggies to the bacon drippings and sauté until onions are translucent, about 2 minutes. Spread the bacon and veggies evenly over the bottom of the pan. Turn up the heat until the bacon and veggies are sizzling. Pour eggs evenly over the mixture. Turn heat down to low and cook 3-5 minutes. Make sure that you don’t have the heat up too high or you will burn the bottom. Move the skillet into oven and place under the broiler. Cook under broiler for about 3 minutes until the eggs are cooked through. Optional – add Gouda or cheddar cheese to the frittata. Add diced green onions with the veggies. Add seasonal veggies like zucchini or spinach. The possibilities are endless. Cover the bottom of the Crock Pot with sliced onions. Mix all seasonings in small bowl. Rub chicken with spice mixture. Place chicken in Crock Pot. Cook 4-6 hours on low until chicken reaches 165 degrees on a meat thermometer. There is no need for liquid in this recipe. The chicken creates its own liquid.. Make this chicken on the weekends to use in wraps, chicken salad, on salads or pizzas. Variation – season with taco seasoning or your favorite seasoning blend. Use the cooked chicken for wraps, salads or for use any time you’d need cooked, shredded chicken. Sometimes I omit the onion when making the chicken for other dishes like chicken pot pie or white chicken chili. This is a huge time saver if you make this on the weekend - just throw the cooked chicken in a variety of dishes - tacos, soups and more.